Students should complete Chapter 2, “Assessment” after completing Chapter 2. 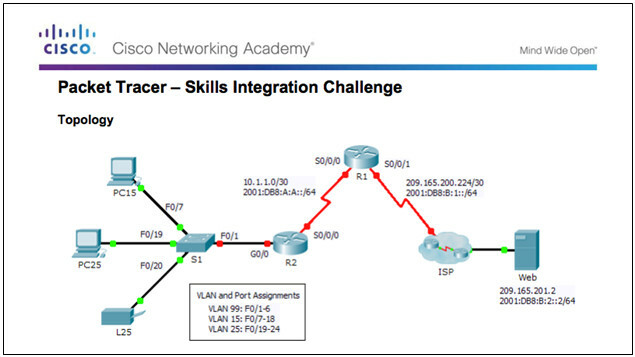 Explain the fundamentals of point-to-point serial communication across a WAN. Configure HDLC encapsulation on a point-to-point serial link. 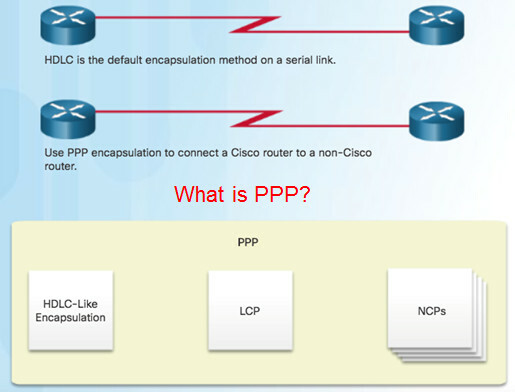 Explain how PPP operates across a point-to-point serial link. Explain the PPP-layered architecture and the functions of LCP and NCP. Explain how PPP establishes a session. 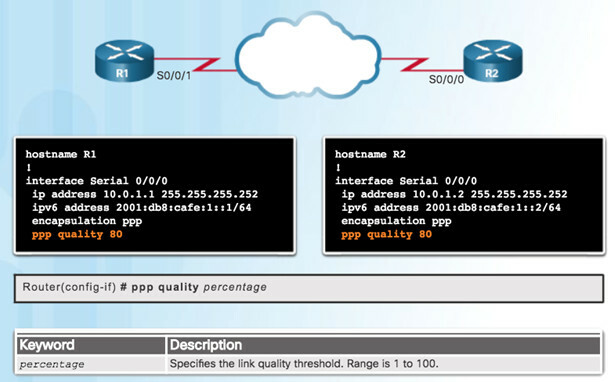 Configure PPP encapsulation on a point-to-point serial link. 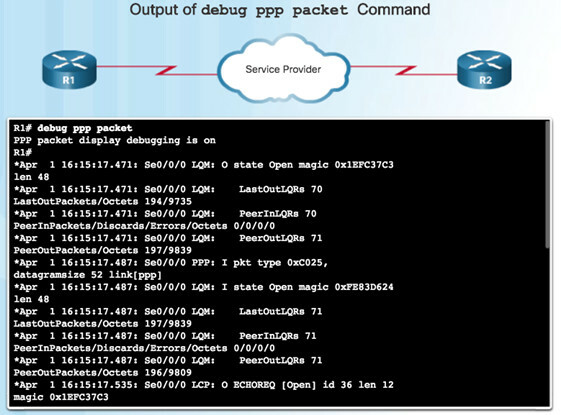 Troubleshoot PPP using show and debug commands. A WAN is owned by a service provider and a LAN is typically owned by an organization. Point-to-point connections connect LANs to service provider WANs and connect LAN segments. A LAN-to-WAN point-to-point connection is also referred to as a serial connection or leased-line connection. Lines are leased from a carrier. Companies pay for a continuous connection between two remote sites, and the line is continuously active and available. Method of data transmissions in which the bits are transmitted sequentially over a single channel. Equivalent to a pipe only wide enough to fit one ball at a time. Multiple balls can go into the pipe, but only one at a time, and they only have one exit point, the other end of the pipe. 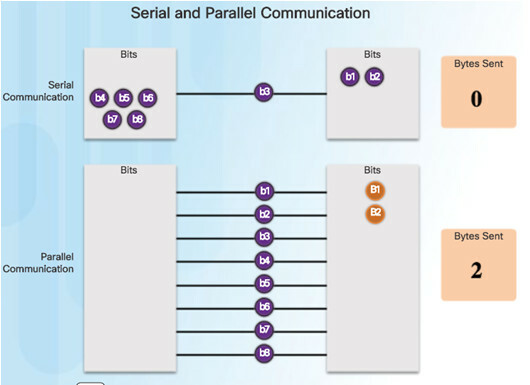 Bits can be transmitted simultaneously over multiple wires. Sends a byte (eight bits) in the time that a serial connection sends a single bit. At one time, most PCs included both serial and parallel ports. Parallel ports were used to connect printers, computers, and other devices that required relatively high bandwidth. On most PCs, parallel ports and RS-232 serial ports have been replaced by the higher speed serial Universal Serial Bus (USB) interfaces. Constant availability is essential for some applications such as VoIP or video over IP. Refers to the rate at which data is transferred over the communication link. 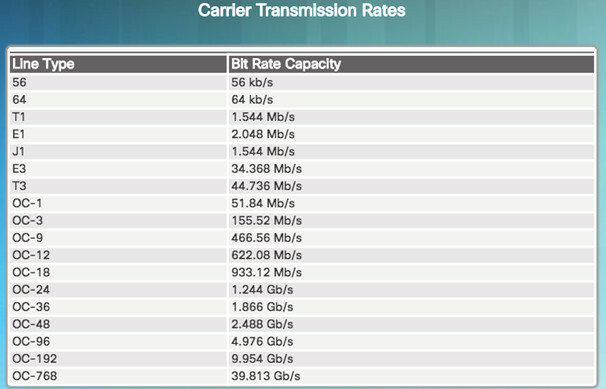 Carrier technology will dictate how much bandwidth is available. OC transmission rates are a set of standardized specifications for the transmission of digital signals carried on SONET fiber-optic networks. In North America, expressed as a digital signal level number (DS0, DS1, etc. ), which refers to the rate and format of the signal. Most fundamental line speed is 64 kb/s, or DS0. 24 DS0s can be bundled to get a DS1 line (T1 line). 28 DS1s can be bundled to get a DS3 line (T3 line). Data is encapsulated into frames before crossing the WAN link and must be configured for the appropriate Layer 2 protocol. Choice of protocol depends on the WAN technology and the communicating equipment. 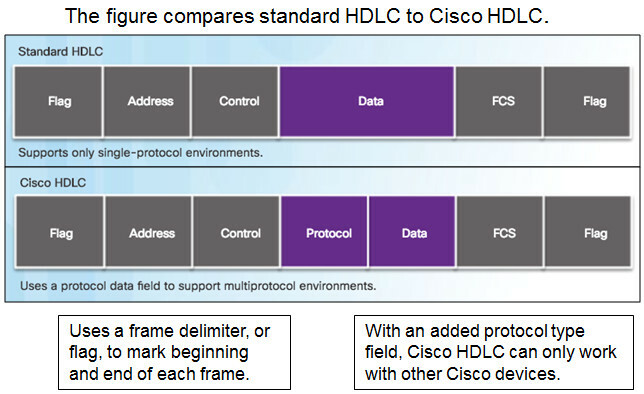 HDLC – Default encapsulation on point-to-point connections, dedicated links, and circuit-switched connections when the link uses two Cisco devices. PPP – Provides router-to-router and host-to-network connections over synchronous and asynchronous circuits. Has built-in security mechanisms such as PAP and CHAP. 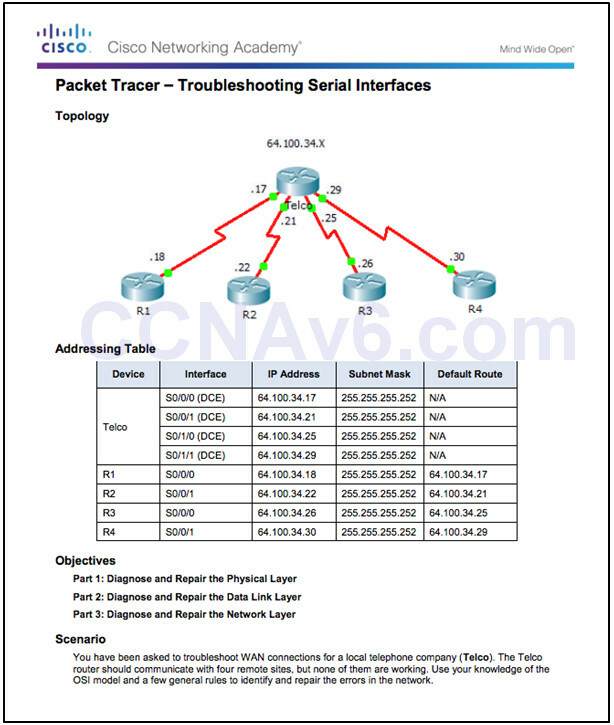 Serial Line Internet Protocol (SLIP) – Displaced by PPP. X.25/Link Access Procedure, Balanced (LAPB) – Predecessor to Frame Relay. Frame Relay – Data link layer protocol that handles multiple virtual circuits. After X.25. ATM – International standard for cell relay in which devices send multiple service types, such as voice, video, or data, in fixed-length (53-byte) cells. Takes advantage of high-speed transmission media such as E3, SONET, and T3..
HDLC is a synchronous data link layer protocol developed by the International Organization for Standardization (ISO). HDLC defines a Layer 2 framing structure that allows flow and error control through acknowledgments. Default serial encapsulation method when connecting two Cisco routers. Cisco’s HDLC is a point-to-point protocol that can be used on leased lines between two Cisco devices. Protocol field makes it possible for a single serial link to accommodate multiple network-layer protocols. Use Cisco HDLC as a point-to-point protocol on leased lines between two Cisco devices. If connecting non-Cisco devices, use synchronous PPP. If the default encapsulation method has been changed, use the encapsulation hdlc command in interface configuration mode to re-enable HDLC. 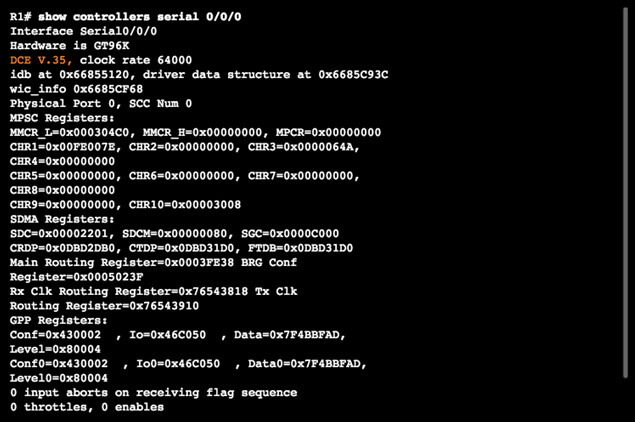 The show interfaces serialx/x/x command displays information specific to serial interfaces. When HDLC is configured, “encapsulation HDLC” should be reflected in the output as highlighted in the figure. “Serial 0/0/0 is up, line protocol is up”, indicates that the line is up and functioning. 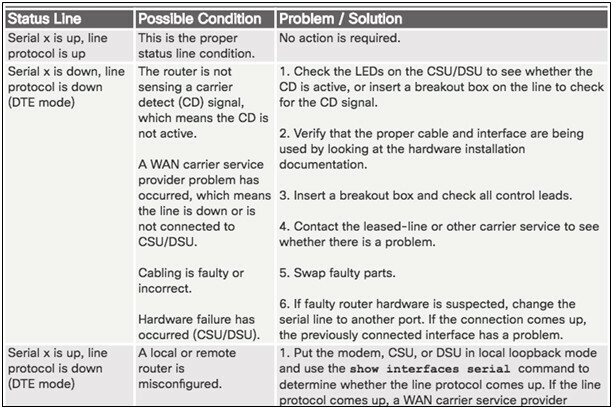 Serial interface issues associated with state, and how to troubleshoot the issue. Show controllers command output indicates the state of the interface channels and whether a cable is attached to the interface. In the figure, interface serial 0/0/0 has a V.35 DCE cable attached. 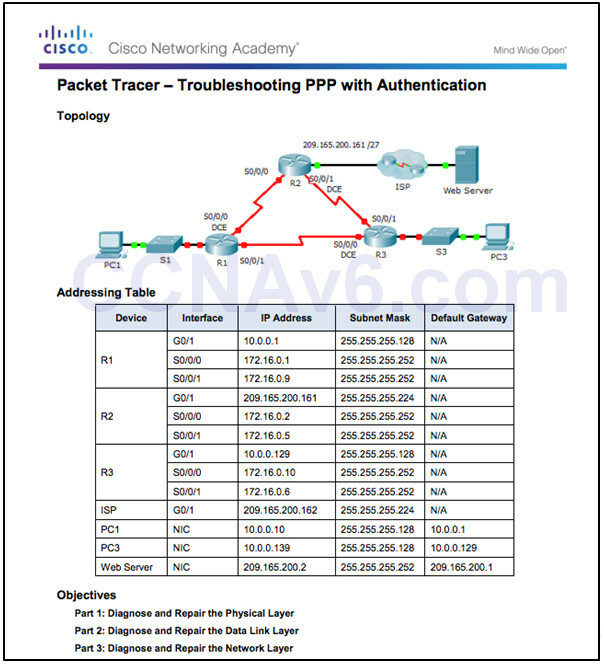 PPP encapsulation should be used when there is a need to connect to a non-Cisco router. PPP encapsulates data frames for transmission over Layer 2 physical links. PPP establishes a direct connection using serial cables, phone lines, trunk lines, cellular telephones, specialized radio links, or fiber-optic links. Network Control Protocols (NCPs) for establishing and configuring different network layer protocols (IPv4 and IPv6 Control Protocol). The link quality management feature (LQM) monitors the quality of the link. LQM can be configured with the interface command ppp quality percentage. If the error percentage falls below the configured threshold, the link is taken down and packets are rerouted or dropped. PPP supports PAP and CHAP authentication. The figure maps the layered architecture of PPP against the Open System Interconnection (OSI) model. 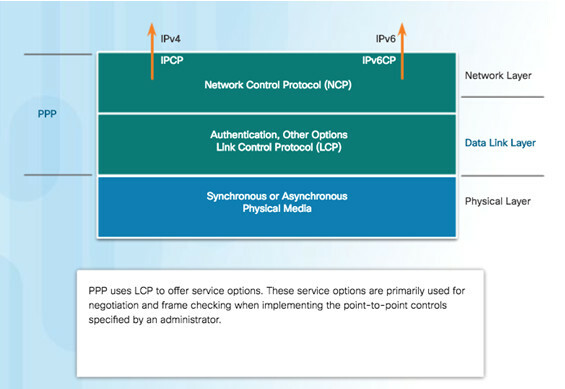 PPP and OSI share the same physical layer, but PPP distributes the functions of LCP and NCP differently. PPP requires a full-duplex circuit, either dedicated or switched, that can operate in an asynchronous or synchronous bit-serial mode. Most of the work done by PPP happens at the data link and network layers, by LCP and NCPs. 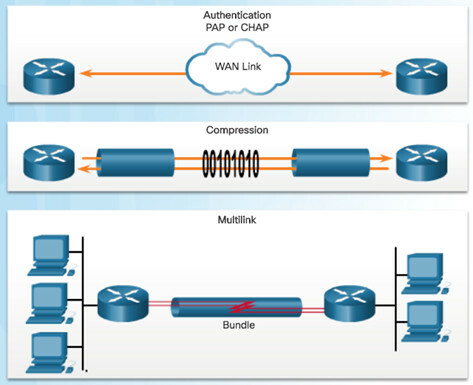 LCP functions within the data link layer and has a role in establishing, configuring, and testing the data-link connection. LCP establishes the point-to-point link. LCP also negotiates and sets up control options on the WAN data link, which are handled by the NCPs. After the link is established, PPP also uses LCP to agree automatically on encapsulation formats such as authentication, compression, and error detection. PPP permits multiple network layer protocols to operate on the same communications link. 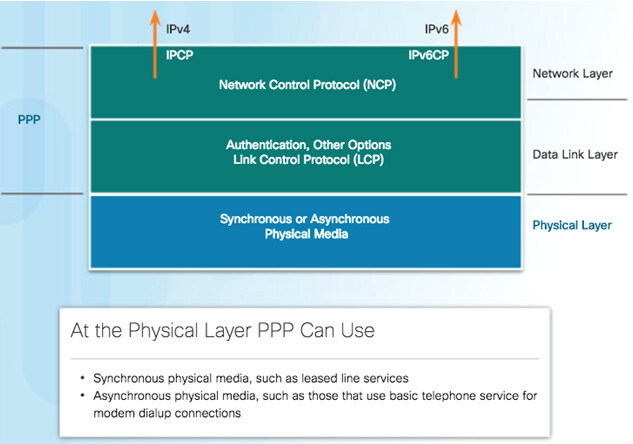 For every network layer protocol used, PPP uses a separate NCP, as shown in the figure. IPv4 uses IP Control Protocol and IPv6 uses IPv6 Control Protocol. 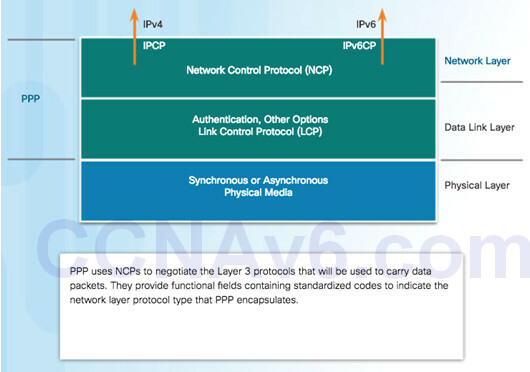 NCPs include functional fields containing standardized codes to indicate the network layer protocol that PPP encapsulates. Flag– A single byte that indicates the beginning or end of a frame. The Flag field consists of the binary sequence 01111110. Control– A single byte that contains the binary sequence 00000011, which calls for transmission of user data in an unsequenced frame. Protocol– Two bytes that identify the protocol encapsulated in the information field of the frame. Data– Zero or more bytes that contain the datagram for the protocol specified in the protocol field. 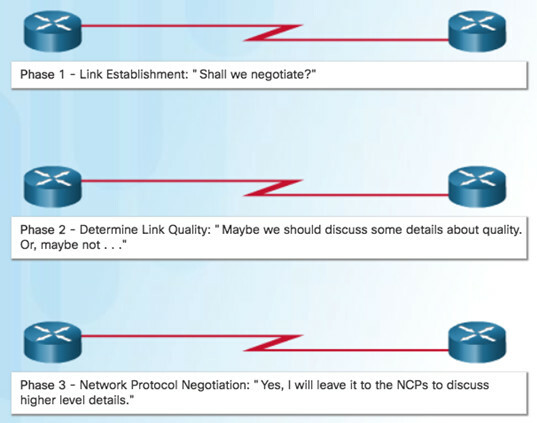 Phase 1: Link establishment and configuration negotiation– Before PPP exchanges any network layer datagrams, such as IP, the LCP must first open the connection and negotiate configuration options. This phase is complete when the receiving router sends a configuration-acknowledgment frame back to the router initiating the connection. Phase 2: Link quality determination (optional)– The LCP tests the link to determine whether the link quality is sufficient to bring up network layer protocols. 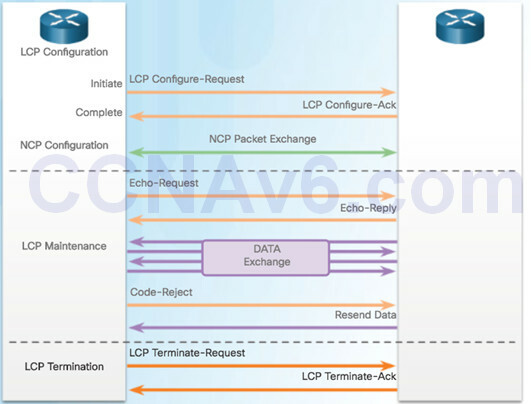 Phase 3: Network layer protocol configuration negotiation – After the LCP has finished Phase 2, the appropriate NCP can separately configure the network layer protocols, and bring them up and take them down at any time. If the LCP closes the link, it informs the network layer protocols so that they can take appropriate action. 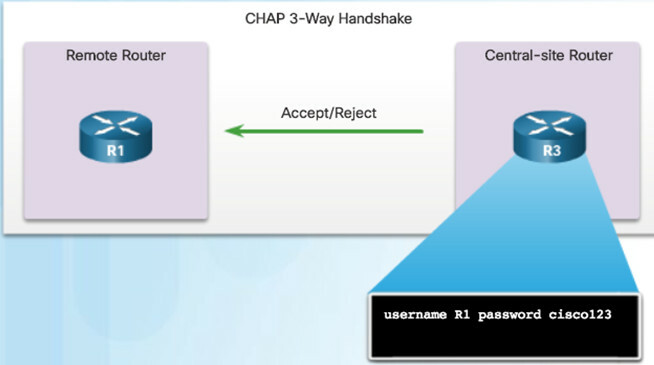 During link establishment, the LCP opens the connection and negotiates the configuration parameters. The link establishment process starts with the initiating device sending a Configure-Request frame to the responder. If the options are not acceptable or not recognized, the responder sends a Configure-Nak or Configure-Reject message. When NCP has completed all necessary configurations, including validating authentication, the line is available for data transfer. 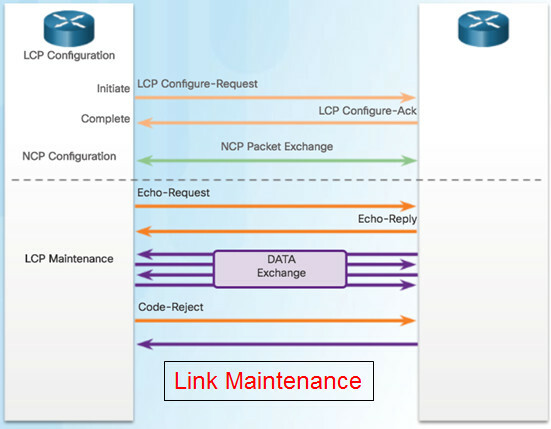 During the exchange of data, LCP transitions into link maintenance. During link maintenance, LCP can use messages to provide feedback and test the link. Echo-Request, Echo-Reply, and Discard-Request– These frames can be used for testing the link. Code-Reject and Protocol-Reject– These frame types provide feedback when one device receives an invalid frame. The sending device will resend the packet. After the transfer of data at the network layer completes, the LCP terminates the link. NCP only terminates the network layer and NCP link. The link remains open until the LCP terminates it. PPP can terminate the link at any time because of the loss of the carrier, authentication failure, link quality failure, the expiration of an idle-period timer, or the administrative closing of the link. The LCP closes the link by exchanging Terminate packets. Device initiating the shutdown sends a Terminate-Request message. Other device replies with a Terminate-Ack. 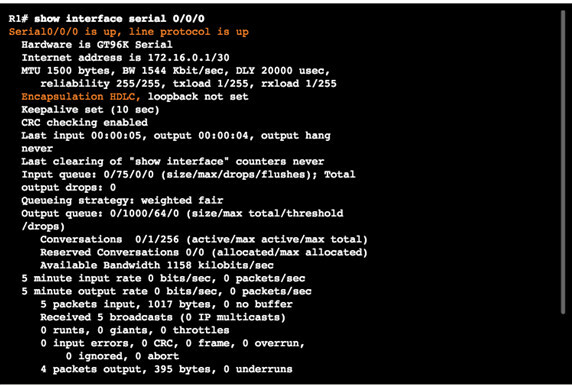 After LCP has established the link, the routers exchange IPCP messages, negotiating options specific to IPv4. IPCP is responsible for configuring, enabling, and disabling the IPv4 modules on both ends of the link. Compression – Allows devices to negotiate an algorithm to compress TCP and IP headers and save bandwidth. IPv4-Address- Allows the initiating device to specify an IPv4 address to use for routing IP over the PPP link, or to request an IPv4 address for the responder. After the NCP process is complete, the link goes into the open state and LCP takes over again in a link maintenance phase. When data transfer is complete, NCP terminates the protocol link and LCP terminates the PPP connection. 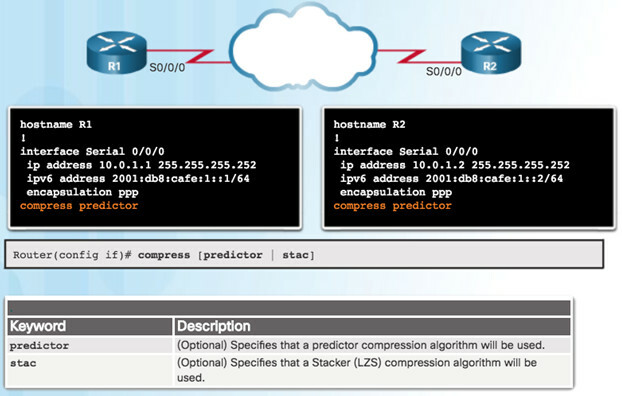 Compression- Two compression protocols available in Cisco routers are Stacker and Predictor. Error detection – Identifies fault conditions. The Quality and Magic Number options help ensure a reliable, loop-free data link. PPP Callback – PPP callback is used to enhance security. 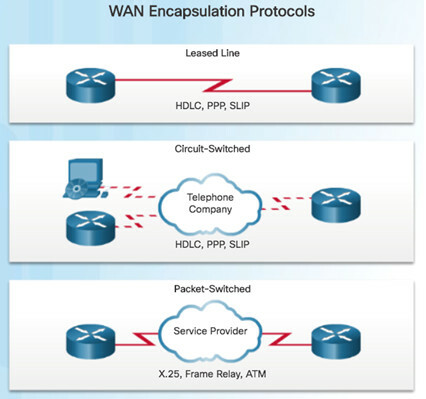 With this LCP option, a Cisco router can act as a callback client or a callback server. Remember that if PPP is not configured on a Cisco router, the default encapsulation for serial interfaces is HDLC. PPP is a Layer 2 encapsulation that supports various Layer 3 protocols including IPv4 and IPv6. Point-to-point software compression on serial interfaces can be configured after PPP encapsulation is enabled. Because this option invokes a software compression process, it can affect system performance. Configuring MPPP requires two steps, as shown in the figure. Step 1. Create a multilink bundle. Step 2. Assign interfaces to the multilink bundle. 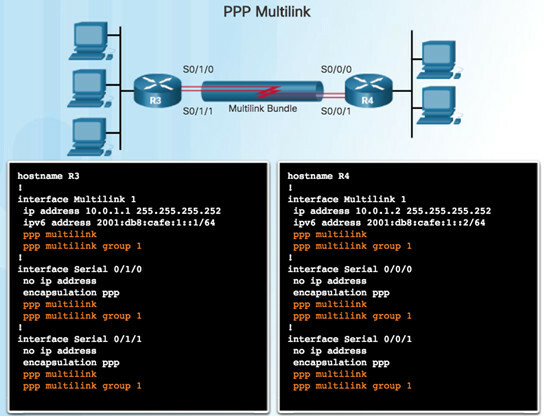 To disable PPP multilink, use the no ppp multilinkcommand on each of the bundled interfaces. PAP is a very basic two-way process with no encryption. The username and password are sent in plaintext. If it is accepted, the connection is allowed. CHAP is more secure than PAP. It involves a three-way exchange of a shared secret. 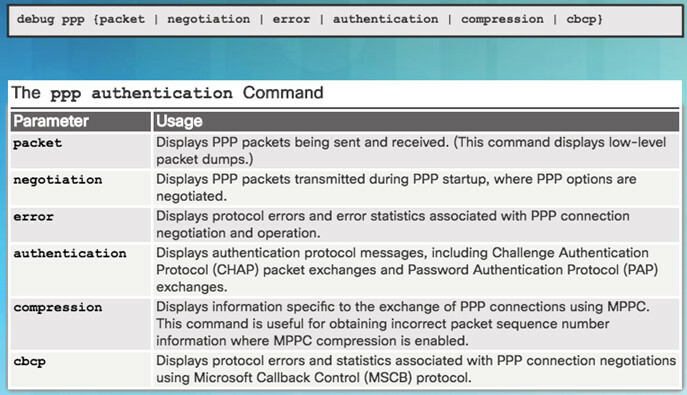 The authentication phase of a PPP session is optional. If used, the peer is authenticated after LCP establishes the link and chooses the authentication protocol. 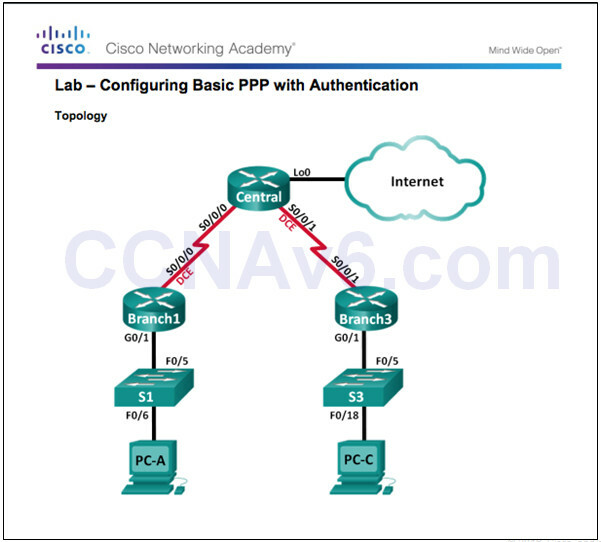 Authentication takes place before the network layer protocol configuration phase begins. Initiating PAP – R1 Sends its PAP username and password to R3. Note: PAP is not a strong authentication protocol. Using PAP, passwords are sent across the link in plaintext and there is no protection from playback or repeated trial-and-error attacks. Completing PAP – R3 Evaluates R1’s username and password against its local database. If it matches, it accepts the connection. If not, it rejects the connection. #1 R3 initiates the 3-way handshake and sends a challenge message to R1. #2 The remote node responds with a value that is calculated using a one-way hash function. #3 The local router checks the response against its own calculation of the expected hash value. If the values match, the initiating node acknowledges the authentication. Note: CHAP conducts periodic challenges to make sure that the remote node still has a valid password value. To specify the order in which the CHAP or PAP protocols are requested on the interface, use the ppp authenticationinterface configuration command. Use the noform of the command to disable this authentication. PAP, CHAP, or both can be enabled. If both methods are enabled, the first method specified is requested during link negotiation. If the peer suggests using the second method or simply refuses the first method, the second method should be tried. 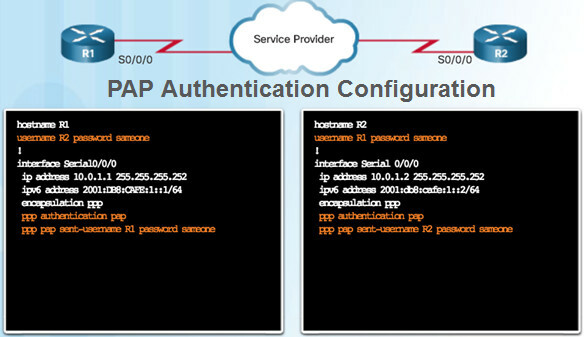 PAP: Hostname on one router must match the username the other router has configured for PPP. The passwords must also match. 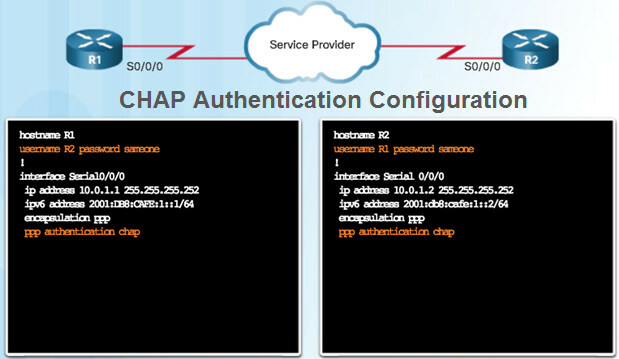 CHAP: Hostname on one router must match the username the other router has configured. The passwords must also match. Occurs on link establishment and can be repeated.